What is a diabetic diet? It is a myth that diabetics need a specialised diet plan to control their diabetes. Diabetes eating myths are prevalent on the internet. Forget them all! Diabetics require a diabetic diet. Diabetes means stop eating what you like to eat. Diabetics need to lose lots of weight and do lots of exercise. Or even a partial truth? Myths about diabetes are everywhere, no more so than with regard to eating. Diabetes eating statements go something like this. Have a special diabetic diet. Cut out the foods you like. Lose a lot of weight. And none of this is true. They are all myths. You can stop worrying now! Now I have told you all the mythical mantras about diabetes eating habits that you cannot, should or must do, we can look at the real truth about diabetic diets and exercise regimes. Why Do We Believe These Myths? Why do we believe that having diabetes means any of these things? Like all urban legends: one person says something (often now on the internet), and like wildfire it turns viral. Then everyone says it, so it must be true. Nobody can be bothered to check the facts, and they restate that which has been said before. Look at the evidence for sensible eating when diabetic. There is no evidence that we should drastically change our eating habits to the extent that we have to cut out any food type. What the evidence does tell us is that, if we modify our eating habits, we can control diabetes. Usually small modifications effect the necessary changes. A diabetic diet is all about being sensible with food choices and how often the 'bad' choices are made. Eating, for diabetics, is all about managing blood sugar levels. but every being on the planet. Manage your blood glucose levels and diabetes will be under control. This is how diabetes eating myths come about. Each has an element of truth within. But the message is only half true, or half understood. You are given the 'Chinese Whisper', when it has passed through half of the whisperers. You take in only part of what is the truth of the matter. If desserts are forbidden, then I may as well not be here! Your body tells you what it wants, and your brain interprets the need. Physical factors impact these positive feedback systems, and the body craves for things when it does not need them. That is what leads to the problems our bodies have. One thing leads to another. ......................... as long as you control your total caloric intake. Denying yourself your favourite foods can lead to binge eating, and then discouragement. The closer you get to your ideal weight the better. But small, sustained, weight-loss improvements, at the beginning of a weight-loss program, have the biggest impact on diabetic health. Studies have shown that losing between 2 kg (5 lb) and 5 kg (10 lb) can improve insulin resistance enough to allow some patients with type 2 diabetes mellitus to quit medication or insulin. is more important than where they come from. but dense bagels have the calorie content of six slices of bread. That's robbing Peter to pay Paul. You cannot lose weight if you reduce calories in one way but increase them in another. To lose weight you must burn more calories than you consume. tend to be heavier than people that don't. And skipping meals tends to make you overeat later. If you have diabetes, it's important to keep up a steady intake of small portions of food throughout the day to keep your blood sugar levels stable and reduce the risk of hypoglycemia. to fat than to burn it as energy. The fact remains that starches (and other carbohydrates) are less dense in calories, gram for gram, than other types of food. The main issue is calories. So if you load starchy food with fat, or eat them in large quantities, the caloric load can add up. Fast food can be worked into your meal plan if you choose well. Opt for grilled foods instead of fried. 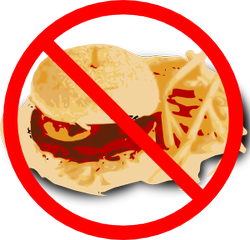 Avoid, or scrape away, high-fat dressings like mayonnaise, and share those French fries around to keep portion size down. Do You Need A Special Diabetic Diet? if you eat small portions, regularly throughout the day. by burning more calories off than you take in. as long as the overall calorie intake is controlled. So you do not require a special diabetic diet, just a reassessment of how much you are eating. Moderation in eating and incremental increases in exercise should do the trick.